Hello, I wanted to pass on some photos of Kidyak that I built last summer. Don't blink, you are not seeing double. Your are looking at a matching pair of Kidyaks I built for our 6 year old twins (they are 7 now). Last summer they each wanted their own kayaks since they were tired of taking turns with rides in my kayak (sharing is just too much work). I saw your plans for Kidyak and it looked perfect for 6 year olds. Most of the paddling we do is in the many reservoirs and remote mountain lakes of Idaho. I wanted a design that was stable enough for a beginner and had good tracking ability to handle windy conditions. They liked the looks of the shark face on the prototype shown on your web site. That is why you see shark faces on theirs. Safety was my primary concern and I liked the enclosed floatation chambers in the ends and the open cockpit for easy entry/exit. These were the first small boats that either of the boys had used and I was surprised at how quickly they mastered them. We camped near Redfish lake in the Sawtooth Wilderness area in central Idaho when the boats were first finished. The first morning we were there the boys put the boats in the water. They were a bit nervous at first but by lunch time they were all over the lake paddling like experience kayakers. 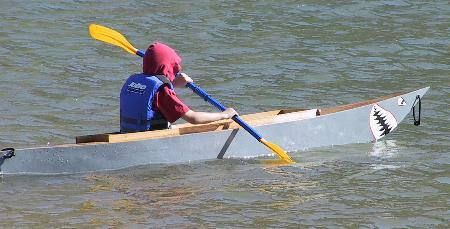 Kidyak is a very stable boat which helps first time paddlers gain confidence quickly. The boys helped build the boats which ads to their enjoyment in using them. They are proud to tell their friends about the boats they built. These were also the first stitch and glue boats I have built and I found it surprisingly easy. Thanks for the great design. This week we are adding more padding for the seats and adding a couple front deck lash points for shock cording to hold a dry bag full of lunch or other things that a 7 year old might consider as necessary expedition gear. I also have two 14 year old boys who are interested in boat building. They have their eyes on Tunnel Mite and Squirt. It looks like I will be placing another order soon.